Women whose breasts appear dense on mammograms have a higher risk for some aggressive breast cancers. One of the strongest known risk factors for breast cancer is high breast density — that is, relatively little fat in the breast and more connective and glandular tissue, as seen on a mammogram. Now, a study has found that higher breast density in postmenopausal women increases the risk of specific types of breast cancer, including some that have a relatively poorer prognosis. The bad news is that — like gender, race, family history, and genetic endowment — breast density is pretty much out of our control. The good news is that as we get older, our breasts tend to become fattier and less dense. Still, some women continue to have dense breast tissue well into their later years. 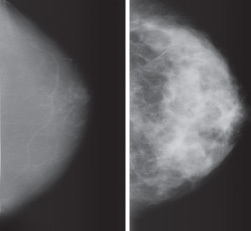 The breast on the left is mostly fat, which appears gray on a mammogram; the breast on the right is mostly dense tissue, which appears white. Tumors and other abnormalities also appear white, so they can be difficult to spot in dense tissue. Mammographic breast density is often classified using a system called BiRads, where 1 is "almost entirely fat" and 4 is "extremely dense." Images courtesy of Rulla M. Tamimi, Sc.D., Harvard Medical School. Some risk factors, such as age, body mass index after menopause, and past use of postmenopausal hormones have been linked to distinct types of breast cancer. But the relationship between breast density and tumor type is less well understood. To investigate, researchers at Harvard Medical School and Brigham and Women's Hospital in Boston compared breast density in 1,042 postmenopausal women who had breast cancer and 1,794 age-matched women who did not have breast cancer. All were participants in the Nurses' Health Study, which has followed more than 120,000 women for 35 years. As expected, the risk of breast cancer was higher for women with higher breast densities. Women with 50% or higher breast density on a mammogram were three times more likely to be diagnosed with breast cancer over a 15-year period than women with less than 10% breast density. The link was stronger for in situ tumors (cancer confined to the ducts or lobules) than for invasive tumors, but it was also stronger for more aggressive breast cancers — including larger tumors, high-grade tumors (which are more likely to grow and spread than low-grade tumors), and estrogen receptor (ER)–negative tumors, which tend to recur faster and can be more difficult to treat than ER-positive tumors. Until this study, research had suggested that breast density was equally associated with ER-negative and ER-positive tumors. The findings appeared online July 27, 2011, and in print Aug. 3, 2011, in the Journal of the National Cancer Institute. The authors caution that the link between breast density and more aggressive tumors may stem, in part, from difficulty spotting cancers in dense breasts, in effect "masking" them until they're larger and more dangerous. However, other studies have shown that the link between breast density and breast cancer risk, in general, is strong independent of this masking effect. Breast density is an important risk factor, but it's not the only one (for a list of risk factors, go to www.health.harvard.edu/womenextra). You and your clinician should know your risk profile and plan screenings and office visits accordingly. Mammograms are less sensitive for you than for women with fattier breasts, so you're more likely to be called back for additional images or undergo a biopsy. Your radiologist may also want to obtain more images using a different method. Hormone therapy increases breast density, so if you're considering it for severe menopausal symptoms, you may want to explore other options. If your overall risk for breast cancer is high, you may want to consider chemoprevention with tamoxifen, which can reduce breast density. A 2008 study showed that women whose breast density decreased by 10% or more within the first year or so on tamoxifen were 63% less likely to develop breast cancer than women taking a placebo. Mammography has been the main focus of breast cancer detection, but almost half of breast cancers in women ages 50 to 69 are first found by the women themselves or their clinicians, according to a study in the August 2011 Journal of Women's Health. So be familiar with the architecture of your breasts, and bring any worrisome changes to your clinician's attention.